So we did it. Well, you did it really. This Mommy Cooks now has 100 followers! That is so exciting!! Well for me at least it is. Keep checking back within the next week and I will be hosting my very first giveaway!! You too can own one of my very favorite kitchen gadgets! OK, now on to today's recipe. Have you ever made Focaccia? Have you ever even had it? I'm sure you have. I think it's the kind of bread the like to serve at Italian restaurants with olive oil to dip it in. Well I saw this on my friend Nancy's blog, Casual Cuisine, and decided to make it a few weeks ago. I made one loaf with cheese, and one without. 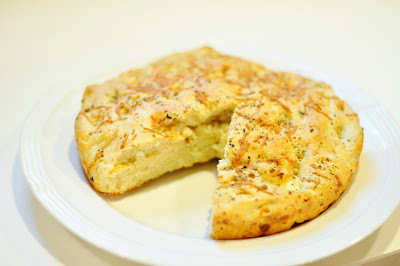 Note that I am posting a recipe for Cheese Focaccia. I liked the one with cheese so much, that's what I'm going to post. It was so yummy! I actually think it could maybe use a little more than one cup of Feta cheese. I've noted that below in the ingredients. If you need to do without cheese, then just omit it, the rest of the recipe is exactly the same. You can change this up with any combination of herbs your little heart desires. And the best thing about this bread? It is so easy to make, and it looks all fancy! (Well my picture doesn't really do it justice, but it could look really fancy.) This would go great dipped in olive oil and herbs, with and dinner, or even a good sandwich. I haven't tried it with my whole white wheat flour yet, next time I will. I'm sure it will be just as good, only healthier. Have I convinced you to make your own bread yet? Don't be scared of that little jar of yeast, it is your friend! It gives you so much yumminess! Combine all of the ingredients, and beat at high speed with an electric mixer for 60 seconds. Add 1 cup crumbled feta cheese to the dough after it's been kneaded for 60 seconds. *If you want to make your bread without cheese, just omit the cheese and follow the rest of the directions. Scoop the sticky batter into the prepared pan, cover the pan, and let it rise at room temperature for 60 minutes, till it’s become puffy. Congrats on your followers! Your focaccia looks delicious. I love it but have never made it. You have convinced me to make my own! Gorgeous Amber! Just gorgeous! I have never tried making Focaccia....you make it look so easy! I'll make it 102 followers! This looks great, thanks. It is just the right size to make and share when using the 2 pans! What a beautiful golden loaf of focaccia. Yum! That looks fantastic! I love breads, though I've never really experimented with making my own. You make this look so easy that I might try it soon! That looks delicious. Homemade bread is always so so yummy. Amber, I'm follower 135, came here through Potluck Sundays. Your foccacia is perfect and you've convinced me that I can make it too. I've just started trying my hand at bread baking.